Series Sunday is a new bookish meme hosted by yours truly, Literary Marie of Precision Reviews. I encourage all of my fellow book bloggers and bookhearts to play along. Post a review/recommendation on your blog, FB, Twitter, Goodreads, or Shelfari pages. Share your review/recommendation by posting the link in the comments section below. Include the title, author, and name of the series so that other Series Sunday participants can add the book to their TBR Lists. 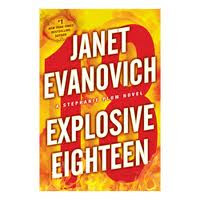 My Series Sunday pick is Explosive Eighteen by Janet Evanovich. It is the 18th book in the Stephanie Plum series. Our one and only New Jersey bounty hunter has finally taken a vacation. Of course the vacation didn't go as planned and Stephanie was forced to leave Hawaii ahead of time. But what really happened while there? Stephanie comes back to Trenton, New Jersey without a ring and the man who sat next to her on the plane didn't board after the layover. Why not? Because he was found dead in a garbage can. A slew of people are searching for his killer and a missing photograph that only Stephanie saw. All of the characters are back: loud Lula, good cop Morelli, mysterious Ranger, gun toting funeral attending Grandma Mazur, alcoholic mother, quiet hungry father, FTA's, exploding black car, etc. The jokes are still there but either flat or just wrong. For example, Grandma Mazur says, "You could have the vitiligo, like Michael Jackson. Remember when he turned white?" SKERT! Too soon, Evanovich. Too soon. If you are hoping this is FINALLY the book where Stephanie makes a choice between Morelli or Ranger, then you will be thoroughly disappointed again. If you are interested in a book where Stephanie is not so predictable, then you will be rolling your eyes again. But if you are interested in keeping up with this series, sit back with this same-story-different-title. The characters have not grown (unless you count growing on the annoyance factor). In fact, the characters actions are so predictable, you can write the ending yourself.